VANCOUVER , Jan. 21, 2019 /CNW/ - Alexco Resource Corp. (NYSE American: AXU) (AXR.TO) ("Alexco" or the "Company") today released the remaining results from its 2018 7,687 meter ("m") surface reconnaissance and deep drilling program comprising 26 drill holes on six targets scattered across the Keno Hill Silver District in Canada's Yukon Territory . The targets were mostly blind, and were selected to determine if the ore control model developed for the Bermingham deposit is duplicated in other areas across the district. In addition, two of the targets were significant step outs – along strike and down dip – from the recently defined Bermingham silver deposit. The results from four surface in-fill holes comprising 1,052 m at the Bermingham NE Zone are also included herein. K-18-0711 intersected the Bear Vein in the Northeast Zone grading 1,453 grams per tonne ("g/t") (46.70 ounces per tonne ("oz/t")) silver ("Ag") over a true width of 2.0 m from 353.0 m including 4,470 g/t (143.71 oz/t) Ag over a true width of 0.60 m . The Bermingham Main Vein grading 418 g/t (13.43 oz/t) Ag over a true width of 2.82 m from 307.25 m was also intersected in this hole. K-18-0706 drilled approximately 200 m down plunge from K-18-0711, intersected a 60 m wide altered and mineralized structural zone from 460 m , containing 1,675 g/t (53.85 oz/t) Ag over a true width of 0.33 m from 467.07 m and 309 g/t (9.93 oz/t) Ag over a true width of 1.01 m from 524.31 m .
K-18-0730 drilled approximately 2 kilometers west of the Bermingham deposit, intersected the inferred continuation of the Bermingham structure returning 234 g/t (7.52 oz/t) Ag over a true width of 1.87 m from 624.32 m including 1,745 g/t (56.10 oz/t) Ag over a true width of 0.23 m and separately 94 g/t (3.03 oz/t) Ag over a true width of 3.80 m from 680.32 m .
K-18-0718 intersected 76.3 g/t gold ("Au") and 105 g/t (3.37 oz/t) Ag over a true width of 1.51 m from 270 m .
K-18-0714 intersected 5.36 g/t Au and 24 g/t (0.77 oz/t) Ag over a true width of 0.70 m from 216.55 m .
Alexco's Chairman and Chief Executive Officer Clynt Nauman commented, "Our late season reconnaissance drilling program answered a number of long standing questions, most importantly confirming the presence of the Bermingham deposit structural framework down plunge of the existing deposit ("Bermingham deep") and the inferred presence of the Bermingham structure more than two kilometers to the west on the heavily covered slopes southwest of the post-mineral Brefalt Fault. Elsewhere from this program, it is clear that the Bermingham/Hector- Calumet style geological architecture can be interpreted at various intervals and elevations along several district scale structures. In 2019 we will launch a further surface drilling program to follow up on our 2018 results, most importantly focusing on the "Bermingham deep" area where our first drill hole K-18-0706 identified a 60 m wide structural zone containing multiple mineralized intervals including 1,675 g/t Ag over a true width of 0.33 m ."
15,314 m of surface drilling in 55 holes including 7,687 m in 26 drill holes in the reconnaissance program, and 3,756 m in 11 holes in the Bermingham in-fill drilling program, as well as 1,179 m in ten holes at Flame & Moth for metallurgical and geotechnical purposed and 2,692 m on third party properties within the district complex. 4,230 m of underground drilling at Bermingham. Drilling at the Bermingham NE Zone has resulted in expansion of the Bermingham deposit into a broad area that remains untested along strike and at depth. Resource extension drilling will continue in this area in 2019 with the aim of further expanding the current Bermingham resource which currently comprises 33.3 million ounces of contained indicated silver at an average grade of 628 g/t and inferred mineral resources of 10.4 million ounces at an average grade of 526 g/t silver (see news release dated September 20, 2018 , entitled "Alexco Updates Bermingham Resource"). 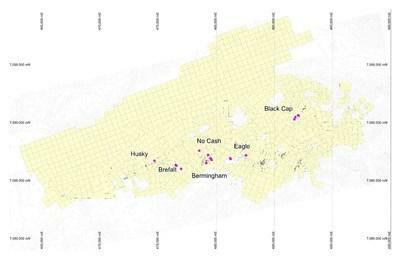 Work completed approximately two kilometers to the west of the Bermingham deposit focussed on finding the inferred fault offset of the mineralized Hector-Calumet and Bermingham structures across the northwest trending post-mineral Brefalt Fault. This fault is interpreted to offset a number of other mineralized systems by up to approximately 1,000 m , including two that have historically produced 148 million ounces of silver. The mineralized offset portion of the major Hector-Calumet / Bermingham vein system is inferred to have now been identified in drill hole K-18-0730 on the southwest side of the Brefalt Fault, thus indicating an unexplored southwest extension of this major mineralized system. The presence of up to 76.3 g/t gold over a true width of 1.5 m in drill hole K-18-0718 and 5.36 g/t gold over a true width of 0.7 m in drill hole K-18-0714 represent a new discovery of gold in the historical No Cash area, approximately one kilometer north of Bermingham. Further work is required to understand the significance of this discovery. The Association for Mineral Exploration ("AME") announced on December 6 th, 2018 the recipients of their 2018 Celebration of Excellence Award winners. Alexco's own Al McOnie (VP, Exploration), Seymour Iles (District Exploration Manager) and Jared Chipman (Sr. Geologist) are being honored with the H.H. 'Spud' Huestis Award for Excellence in Prospecting and Mineral Exploration. This award is a result of their work on the recent discovery and delineation of more than 60 million ounces of silver in the Flame & Moth and Bermingham deposits in the Keno Hill Silver District. CEO Nauman stated, "We are extremely proud of the work that Al, Seymour, Jared and the entire geological team at Alexco have performed with respect to the Flame & Moth and Bermingham discoveries. This award is a prestigious honor as, not only does it recognize their outstanding work, it validates one of Alexco's founding principles which is the systematic application of sound and basic exploration practices." A detailed airborne magnetic and resistivity geophysical survey was completed over Galena Hill in 2018. The survey results will allow for generation of a greatly refined model of the geological framework of Galena Hill and assist in continued district exploration. Completion of mine planning, mine scheduling and metallurgical work related to the updated production plan is proceeding on schedule with results anticipated to be available in late February or early March. The 2018 exploration drill program and sampling protocol has been reviewed, verified and compiled by Alexco's geologic staff under the supervision of Alan McOnie , Vice President, Exploration for Alexco and a Qualified Person as defined by National Instrument 43-101 ("NI 43-101"). A rigorous quality control and quality assurance protocol is used on the project, including blank, duplicate and standard reference samples in each batch of 20 samples deliver to the assay lab. Drill core samples were direct shipped to ALS Minerals Lab at Whitehorse , Yukon for preparation, and to the ALS Minerals facility in North Vancouver, British Columbia for fire assay, multi-element ICP and overlimit analyses. The disclosure of all other scientific and technical information contained in this news release regarding projects on Alexco's mineral properties have been reviewed and approved by Mr. Alan McOnie , FAusIMM, Alexco's Vice President, Exploration, who is a Qualified Person as defined by NI 43-101 – Standards of Disclosure for Mineral Projects.